As a kid I loved paper-based mazes. I loved to complete them and I loved to make them. So I tried to come up with a way to combine therapy and labyrinths to get my students excited about these cool puzzles, as well. 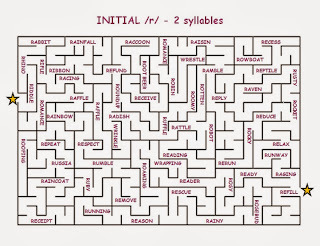 I came up with an articulation maze – a maze that contains students’ targets words at every turn! Not only would students be required to test their problem solving skills, but they would also have to work on their articulation skills! And because the activity is combined with movement, it may aid in generalization. This week I finally got to try my mazes out! And I have to admit, they worked just as well as I had hoped! In order to complete the maze, the student had to make their way from a star on one side to the star on the other side. I had each student stop their pen when they got to a word and had them practice the word 5 times. I got hundreds of productions out of my kids, especially because they lost their way a few times and had to backtrack. In an effort to save paper and ink, I used see-through dry erase pouches. The kids loved to erase the lines at the end. One of my /r/ students making her way through the maze. These would work well for Speech stations, independent practice, and group activities (the first person to get to the end is the winner). 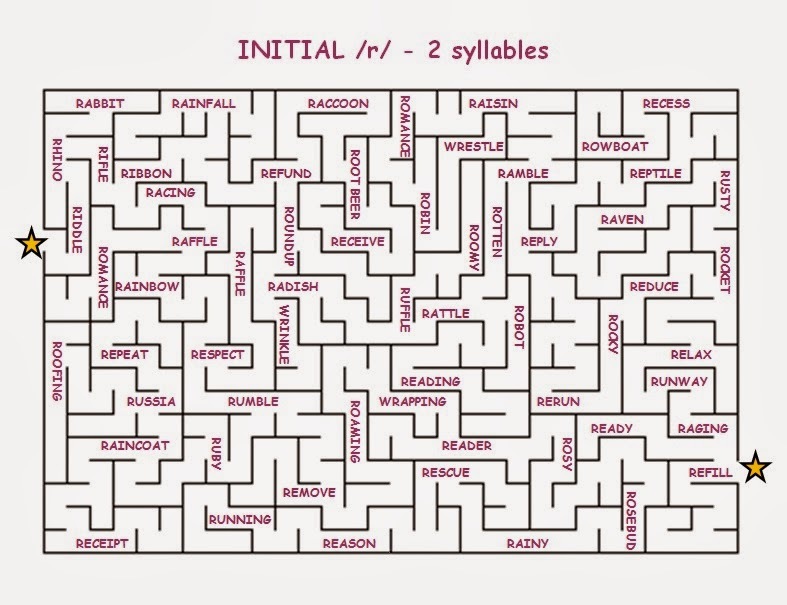 You can also change up the rules a little and ask students to find their way to every single word or find a path to one particular word within the maze. I am hoping to make more mazes for other target sounds in the future! If you’d like to give these a chance, please come and visit my TpTstore!